The state government of Gujarat will soon launch the online registration program for the unprivileged students of standard-1. The official notification of the program will also be released soon. Every year, the students of 1st standard are able to apply for the RTE program which is a reservation program and it reserves 25 percent seats for the unprivileged students in the private schools of India. Indian government has always been proactive in ensuring educational privileges to the underprivileged students of the society and to ensure proper education for them the government introduced the RTE or Right to Education Act. Under this act, all the private schools are ordered to reserve 25 percent of their seats for the underprivileged students. The state refunds the private schools for the reserved seats and this act was introduced to ensure that all the children between the age of 6 and 14 are getting proper opportunities to complete their primary education. The online registration system will be a useful system for the applicants of the RTE Gujarat 2018-19 program. The online application is expected to start from 28 February and the deadline (last date) of the online application system is yet to be announced by the state government of Gujarat. The applicants will be able to apply online for the RTE Gujarat program of 2018-19 session by following the steps mentioned below. 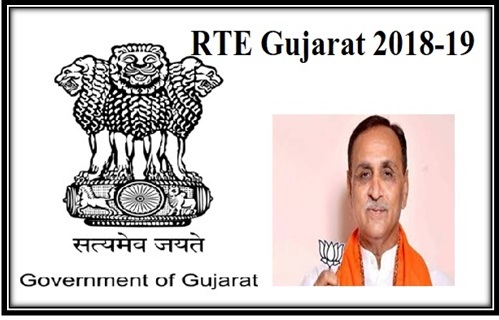 To apply for Gujarat RTE 2018-19, an applicant will be obliged to visit the official website of Gujarat RTE and select the option named “Online Application” from the homepage of the official website. After that, an applicant will have to carefully read all the instructions regarding the online admission procedure and an applicant will have to ensure they have read and understood all the terms and conditions. After properly reading the instructions, an applicant will have to carefully fill out the application form. The applicants will have to provide all the necessary details and also the applicants will need to provide authenticated details. After that, the applicants will be able to download a printout of their application form and then they will be able to submit it to the receiving center. The applicants will also be able to download the application form and manually fill it. The government will provide a deadline for all the application forms to be submitted and after the deadline, the government will acquire all the application forms and create admit cards for the applicants. If an applicant wishes to apply for the RTE Gujarat program, they will be obliged to submit the following list of documents to the concerned authority. Address Proof:All the applicants will need to provide proof their address and for this case the applicants will be able to use any identification document issued by the government such as Passport, Aadhar Card, Driving License, etc. The applicants will also be able to provide bills such as Electricity/Water/Telephone Bill. Also, Notarized Rent Agreement may be provided to verify the address of the applicant. Caste Certificate & Income Certificate: The parents of the students will have to provide their caste certificate and income certificate. In order to verify their caste, the parents will have to provide their Mamlatdar Certificate to the authorities. Also, the parents will have to provide their income certificate which must be issued by a competent authority. Birth Certificate and Photograph: The birth certificate and the photograph of the students will need to be provided. In this case, all certificates issued by the Gram Panchayat/ Nagar or Maha Nagar Palika/Hospital register will be accepted. Also the applicants will be able to provide an affidavit by the parent/guardian confirming the birth date of the student. Also, a passport sized color photo of the students must be provided while submitting the application form. BPL & NDNT: The applicants will have to provide their Below Poverty Line Ration Card and also they must provide NDNT which must be issued by a competent authority for verification purposes. CWSN, HIV Affected& Mentally Challenged Students: The students belonging to the category of Children with Special Needs (CWSN) will need to provide a certificate from a civil surgeon. The HIV affected and mentally challenged students will also need to provide a certificate from a civil surgeon. Orphan Students: In case a student is orphan, they will have to provide their orphanage certificate as a proof and they will also be able to provide an affidavit by their guardian. Child Labor: In case a student is a child labor, they will have to provide a certificate which must be issued by the Labor & Employment Department. The students whose parents are migrating laborers will also have to provide this certificate. Special Cases: In case a student is in the category named Child in Need or Care and protection or in case a student belongs from a Child Care institute, they will have to provide their Bal Suraksha Adhikari Certificate. All the information about Gujarat RTE will be released soon and thus the applicants will be able to know it from the website of RTE Gujarat (http://www.rtegujarat.org/ ) also.